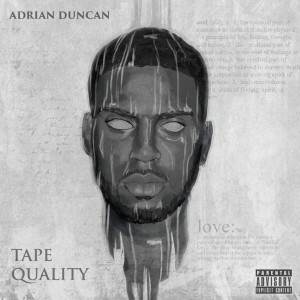 Artist Adrian Duncan, whom the Matik Magazine has previously covered in the past (you can read his full interview here) has officially released ‘Tape Quality’ his inaugural mixtape. This mixtape is his introduction to the world and in this project he certainly does not disappoint. The production on this mixtape ranges from Ethan Ryan, who produces 3 songs including Lost, Seasons and Venting, 318tae, Canei Finch, Samurai Guru and Lil’ Jay. The entire project was mixed and mastered by Dj Karim K.
The opening song ‘Lost’ sets the tone on what to expect from this mixtape. It shows Adrian Duncan sounding vulnerable and displaying his thoughts to his listeners. It really demonstrates him opening up to them. One notable from this song that really sums himself up is “My only enemy is my conscious, I’m just trying to be free. What should I make my rap name if I’m just tryin’ to be me?” The final line of this song Adrian says “I’d like to welcome you to my mind” and in this mixtape he does just that. This is the most ideal introduction of not just an artist, but for a musical project. For the next 8 tracks you’ll be entering the world of Adrian Duncan, which consists of a lot of soulful music, story-telling and self-reflection. The next song up is ‘Changes’ and it showcases Adrian Duncan telling his story of being a young up-and-comer trying to make a name for himself in music. 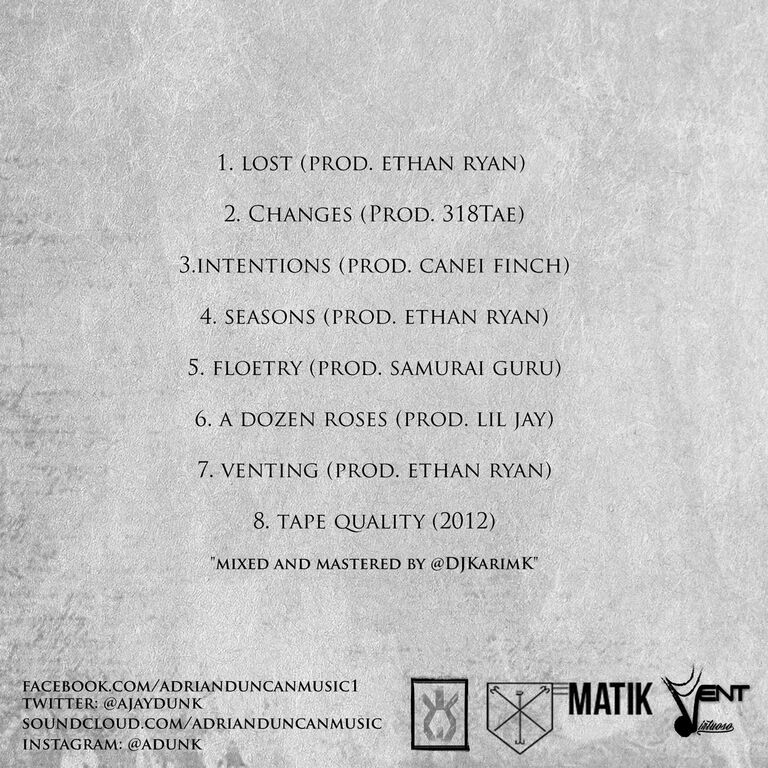 ‘Intentions’ is up next and is also one of the lead singles for this mixtape. Production comes by way of Canei Finch. It tells the story of Adrian being with a faithful girl but dealing with the temptations of other females; “What I want vs. What I need”. This is when Adrian is at his best; discussing a common theme that is relatable but also allows him to showcase his skills. ‘Seasons’ is the fourth song and in it Adrian is discussing about the different girls he’s had relationships with throughout the different seasons. It features clever rhymes referencing emotions and the different seasons throughout the year; “Summer is open season, by September she’ll be leaving” which is a double entendre between the act of leaving and the leaves of Fall. It also features a well-executed guest appearance from Dj Karim K, who complements the song well with his witty yet calm delivery on this laid-back and slow beat. It has elements of old-school hip-hop which is a common theme in this mixtape. ‘Floetry’, which was the first single released off of this mixtape shows Adrian Duncan doing what he does best; story-telling. It is relatively short with a run time of 1 minute and 55 seconds, but it is a powerful and meaningful song. Production of this song is courtesy of Samurai Guru. A Dozen Roses has Adrian rapping about a argument he is having with his girl. Although he has made mistakes and has his faults, he is confessing to her that he’s willing to work through them to make sure things work out between them. “Can we look forward and not look back? Let all of the white lies fade to black” Adrian raps as he’s pleading with her, trying to salvage their relationship. The whole song seems cinematic as it opens up with a skit of a couple arguing. The skit also continues halfway through the song as well as the ending. On ‘Venting’ you hear Adrian Duncan show his lyrical ability. What makes this song intriguing is the emotion Adrian demonstrates in it. He shows a sense of anger and vulnerability in his delivery, which is evident once you listen to it. The instrumental is reminiscent of Drakes ‘Successful’. ‘Tape Quality’ closes out with a self-titled song. The song is relatively upbeat and has a bit of a old-school, 90’s feel to it. It is a revealing song to who Adrian Duncan is and shows his intentions (no pun intended) on what he really hopes to accomplish with his music. He also shows just how lyrical he can be. With the way the whole mixtape is structured, this is a fitting closing to a brilliant mixtape. Overall, the mixtape is great. It is his first full body of work and it definitely lived up to expectations. ‘Tape Quality” is exactly as it’s name suggests, it is a high quality project that is definitely album worthy. It features brilliant production and DJ Karim K does a great job at mixing and mastering the project. The entire project from the instrumentals to production, really complements Adrian’s style and sound. The mixtape is 8 songs, but it is understandable as it is his first mixtape. Plus, there is the golden rule of quality over quantity which certainly applies in this case. When Adrian decides to release his next project I hope it is slightly longer. As a listener you’ll definitely be able to tell that old-school hip-hop, as well as artists such as J. Cole, and other soulful artists inspired him. If you’re looking to take a break from the upbeat, bass heavy trap music or are interested in 90’s hip-hop or soulful sounds, this project is definitely for you. Adrian Duncan has introduced himself to the world and now it’s just the beginning for him. You can listen to the full mixtape here or on his SoundCloud! Also be sure to follow him on his social networks! 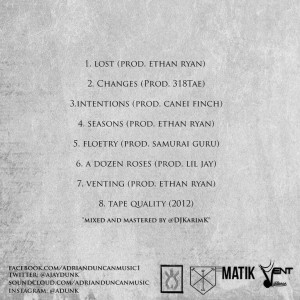 You can download ‘Tape Quality’ here! Also be sure to follow the reviewer and writer of this article Yusuf on his social networks!